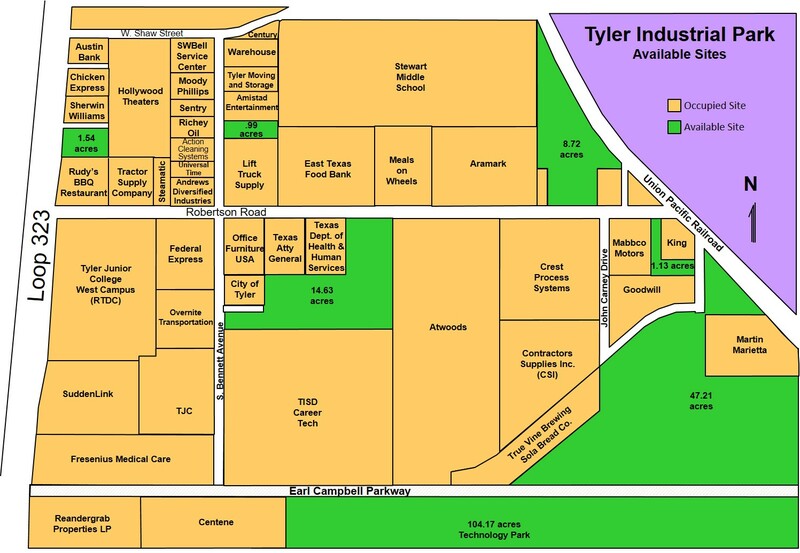 The Tyler Economic Development Council (TEDC) has owned and managed 150-acres within the Tyler Industrial/Business Park since 1994 . The park is located at the intersection of west Loop 323 and Robertson Road and is occupied by a variety of manufacturing, office, distribution, and retail businesses. Approximately 90 acres of greenfield remain in the park, all zoned M-1 with the exception of the pad site in front of Hollywood Theaters. 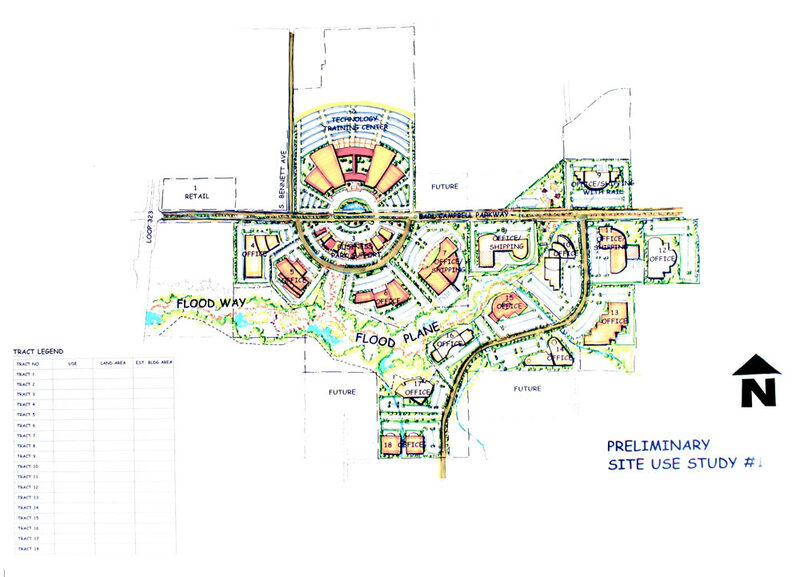 Although one of the available sites is strictly available for retail development due to its size and location, the TEDC aggressively promotes the majority of sites for manufacturing, distribution, and corporate headquarters and is very amenable to businesses that create a significant amount of new jobs and investment. Utilities for electric, gas, water, and storm sewer are available at all sites. However, some or all the utilities may need to be extended on larger sites pending the amount of land purchased, the configuration of constructed facilities, and the overall volume of services needed. Fiber optics are also available in the park but are not extended to each site. Along with the City of Tyler's zoning and permitting requirements, the TEDC also enforces a set of covenants/deed restrictions that define the type of construction and development requirements of newly purchased sites. These rules help the park maintain a pleasant business park look. To view a copy of these covenants, click the link below. One additional set of restrictions apply for the remaining pad site in front of Hollywood Theaters. This agreement, between the land owner and Hollywood Theaters, outlines the appropriate uses of the site, sharing of common areas, and other issues that would directly affect the purchase. More information about this agreement can be found in the Retail section of our site. 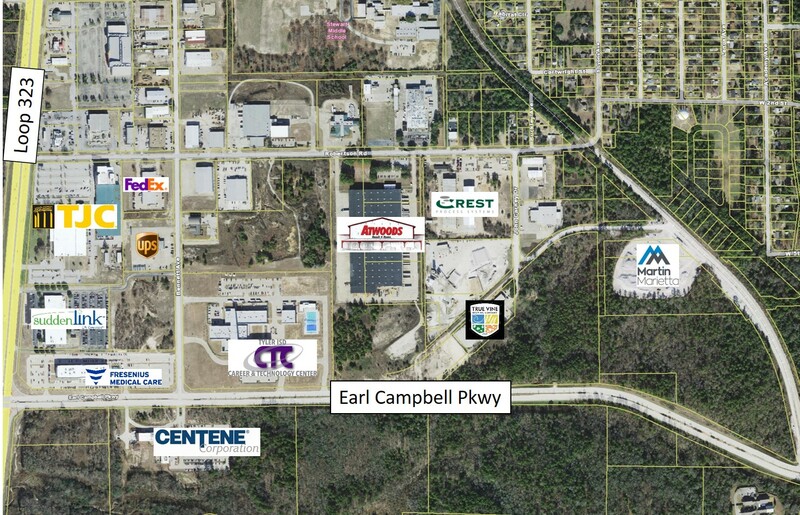 In 2009 TEDC extended South Bennett Avenue to intersect with Earl Campbell Parkway and acquired an additional 140 acres to develop as a business & technology park. Click here to view a prelimiary site use image.